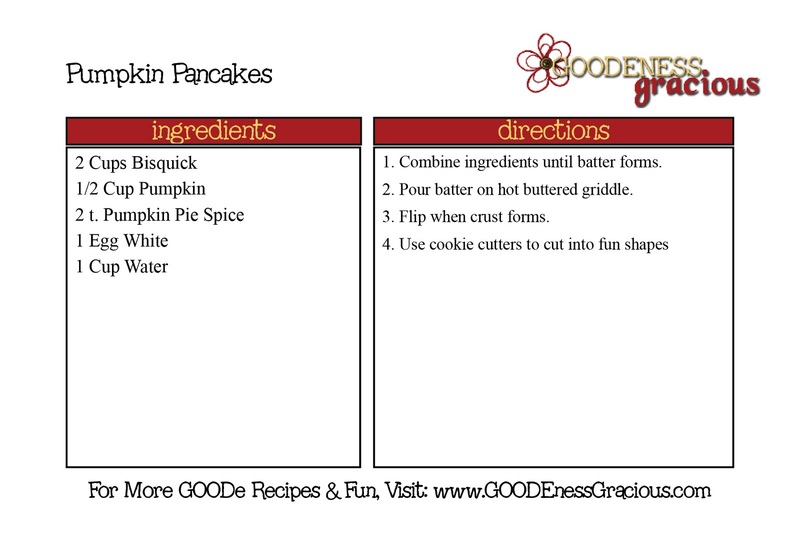 Tonight’s Goode & Gooseberry Project Recipe is Pumpkin Dip with my Pumpkin Pancakes for a spooky treat! The other day Miss Add and I were in a fall mood decided to make some Pumpkin Pancakes now that we have pumpkin on our grocery store shelves… HALLELUJAH! So I grabbed some Bisquick and pumpkin and gots down to business. This is a GOODe little set from Wilton (in the cake decorating aisle) that is chock-full of family fun for only $10! We chose to use black cats and spooky moons for this special recipe! It was so super easy… it is dangerous… seriously. Dieters beware. You just take an 8 oz. block of room temperature cream cheese. Now for those of you concerned about all that wasted pancake from cookie cuttin’… haven’t you heard about the delicacy known as “Mommy Bites”?